So this is by no means a restart of this blog. In a perfect world I’d post regularly (not with years in between), but I simply lack time and motivation. I just had an observation that I’d like to share with the internet. At the moment I’m writing an essay on the usage of history on the banknotes of post-independence Ukraine and today I, again, visited the royal coin cabinet of Stockholm. I was very happy to find a couple of coins from the medieval Kiev Rus’ era featuring to dudes which have returned in the modern era. 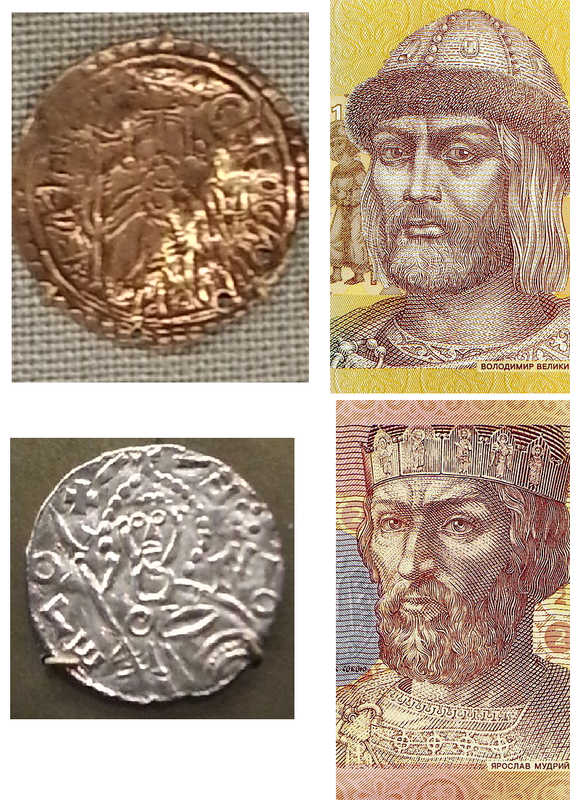 The two coins above are from the 10th and 11th centuries and the feature the Rus’ princes Volodymyr (often called the great) and Yaroslav (the wise). To the right of the coins are portrays of the princes on the current edition of the Ukrainian hryvnia. It’s fascinating that a thousand years since these princes lived they still play an important role in the creation of a modern Ukrainian identity. It should of course be mentioned that they also play a huge role in the creation of modern Russian identity as well, even though I’ve yet to seen them on the ruble. Who knows, maybe I’ll write some more in the future! In Sweden Christmas Eve, this day, is the most important day of Christmas. So here is a greeting from snowy Uppsala, Sweden. Merry Christmas! God Jul! Moldova is an ex-soviet state which gained its independence with the fall of the USSR in 1990/1991. Since the independence Moldova has had quite a troublesome time. The country hasn’t had the same economic development like successful ex-soviet states such as Estonia, and Moldova is today considered to be one of Europe’s poorest countries. It’s been politically unstable as well. Just a couple of years ago, in 2009, the parliament was besieged by angry protesters. Fortunately Moldova has been spared by the type of dictatorship still present in Belarus. Unfortunately I would have to say that Moldova is one of Europe’s most anonymous countries. A minority of people in Sweden knows the location of the country and fewer knows the name of the capital Chișinău (many people think that this is hard to pronounce). It’s sad, because I think that the country has a lot to offer, with a rich and diverse culture and history. The Moldovan coat of arms is featured on the coin, and my favorite part of is the small cross in the eagle’s beak. 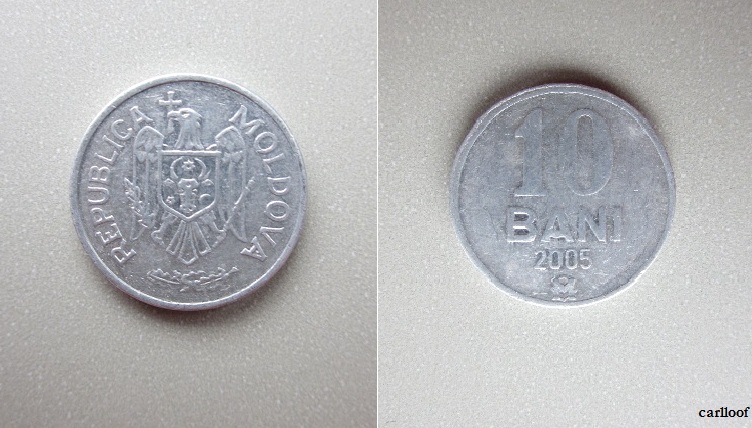 The bani is the subunit of the Moldovan leu. One last thing that I need to say about Moldova is that they always have very catchy song in the Eurovision Song Contest (a music competition with European countries represented by one song each). This song is from Moldova’s first year in the competition. In translation it’s called: Grandmamma Beats the Drum. 11 years ago the world changed drastically. On this day a large portion of the world turned to fear and prejudice instead of reason. On this day many people lost their lives and many people are continuing to do that. Violence feeds violence, and will continue to do so until we start using other means of solving our differences. Here is a state quarter (25 cent) from the state New York. This coin was minted 11 years ago in 2001. 1788 is the year when Ney York became a member of the union. The coin features George Washington on the obverse side (like all quarters) and on the reverse side you can see the outlines of the state with the Hudson River and the Erie Canal marked on it. In the foreground stands the Statue of Liberty. Through history New York has been the first place that immigrants come to when looking for a better life in America, it is because of this that the caption “Gateway to freedom” is featured on the coin.